All vehicles must display a 2012-2013 Cicero vehicle sticker on the passenger side of their windshields before July 1 to avoid late fees and traffic violations. All outstanding vehicle parking tickets must also be paid in full before a sticker can be obtained by a vehicle owner. 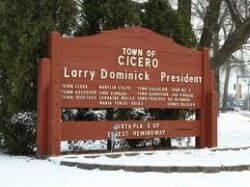 Cicero vehicle stickers are $40 for passenger vehicles, and for each of the first four vehicles in one family at one address. A sticker for the 5th vehicle is $145 and the fee for a 6th vehicle is $185. Applicants must also provide proof of current vehicle insurance. The Town Collector’s office is located on the first floor of the Town Hall building at 4949 W. Cermak Road. Applicants can pay using a check, money order or cash.